2) Ambient Operating Temperature and acceptable temperature rise. Ambient temperature of over 100 deg C is now quite common. 4) Costs : iron Powder being the cheapest and MPP, the most expansive. 6) Availability of the core material. For example, Micrometals #26 and #52 are mainly available from stock. Most commonly available MPP cores is the 125 permeability materials, etc. As a result of recent advances in ferromagnetic technology, a greater choice of core materials for design optimization is now available. For switch mode power supplies (SMPS), inductors, chokes and filters, typical materials are MPP (molypermalloy powder), High Flux , Sendust, and Iron Powder cores. Each of the above power core materials has individual characteristics suitable for different applications. 1) Micrometals for iron powder cores. Only Micrometals cores are tested for thermal stability and CWS only uses Micrometals cores in all its designs. With powder cores, high permeability material is ground or atomized into powder. The permeability of the cores will depend on the particle size and density of the high permeability materials. Adjustment of the particle size and density of this material leads to different permeability of the cores. The smaller the particle size, the lower the permeability and better DC bias characteristics, but at a higher cost. The individual powder particles are insulated from one another, allowing the cores to have inherently distributed air gaps for energy storage in an inductor. This distributed air gap property ensures that the energy are stored evenly through the core. This makes the core have a better temperature stability. Gapped or slitted ferrites stores the energy in the localized air gap but with much more flux leakage causing localized gap loss and interference. In some cases, this loss due to localized gap can exceed the core loss itself. 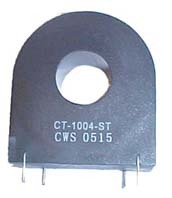 Due to the localized nature of the air gap in a gapped ferrite core, it does not exhibit good temperature stability. Optimum core selection is to choose the best material with a minimal compromise while meeting all design objectives. If cost is the primary factor, iron powder is the choice. If temperature stability is the primary concern, MPP will be the first option. The attributes of each type of material are discussed briefly. Compared to other materials, MPP cores are the costliest, but highest quality in terms of core loss and stability. For application involving DC bias condition, use the following guidelines. To get less than 20% decrease in initial permeability under DC bias condition:- For µi= 60 cores, max. DC bias < 50 oersted; µi=125, max. DC bias < 30 oersted; µi=160, max. DC bias <20 oersted. Lowest core loss among all the powder materials. Low hysteristics loss resulting in low signal distortion and low residual loss. Best temperature stability. Under 1%. Most commonly used in aerospace, military, medical and high temperature application. Most readily available as comapred to high flux and sendust. High Q filters, loading coils, resonant circuits, RFI filters for frequencies below 300 kHz, transformers, chokes, differential mode filters, and DC biased output filters. High Flux cores is composed of compacted 50% nickel and 50% iron alloy powder. The base material is similar to the regular nickel iron lamination in tape wound cores. High Flux cores have higher energy storage capabilities, and higher saturation flux density. Their saturation flux density is around 15,000 gauss ( 1500 mT), about the same as iron powder cores. High Flux cores offers slightly lower core loss than Sendust. However, High Flux's core loss is quite a bit higher than MPP cores. High Flux cores are most commonly used in application where the DC bias current is high. However, it is not as readily available as MPP or Sendust, and are limited in its permeability choices or size selections. 1) In Line Noise filters where the inductor must support large AC voltages without saturation. 3) Pulse Transformers and Flyback Transformers as its residual flux density is near to zero gauss. With the saturation flux density of 15K gauss, the usable flux density ( from zero to 15K gauss) is ideally suited for unipolar drive applications such as pulse transformer and flyback transformers. Sendust cores are also known as Kool Mu® from Magnetics Inc., Sendust material was first used in Japan in an area called Sendai, and it was called the 'dust' core, and thus the name Sendust. In general, sendust cores have significantly lower losses than iron powder cores, but have higher core losses than MPP cores. Compared to iron powder, sendust core loss could be as low as 40% to 50% of Iron powder core loss. Sendust cores also exhibits very low magnetostriction coefficient, and it is therefore suitable for applications requiring low audible noise. Sendust cores has a saturation flux density of 10,000 gauss which is lower than Iron powder. However, sendust offers higher energy storage than MPP or gapped ferrites. Sendust cores are available in initial permeabilities (Ui) of 60 and 125. Sendust core offer minimal change in permeability or inductance (under 3% for ui=125) under AC excitation. Temperature stability is very good at the high end. Inductance change is less than 3% from ambient to 125 deg C. However, as the temperature decreases to 65 deg C, its inductance decreases by about 15% for µi=125. Also note that as temperature increases, sendust exhibits a decrease in inductance versus an increase in inductance for all the other powder materials. This could be a good choice for temperature compensation, when used with other materials in a composite core structure. For µi= 60 cores, max. DC bias < 40 oersted; µi=125, max. DC bias < 15 oersted. Lower core loss than Iron Powder. Low magnetostriction coefficient, low audible noise. Phase control circuits (low audible noise) light dimmers, motor speed control devices. Iron powder is the most cost effective of all the powder cores. It offers a cost effective design alternative to MPP, High Flux or Sendust cores. Its higher core loss among all the powder materials can be compensated by using bigger size cores. In many applications, where space and higher temperature rise in the iron powder cores are insignificant compared to savings in costs, iron powder cores offers the best solution. Iron Powder cores are available in 2 classes : carbonyl iron and hydrogen reduced iron. Carbonyl iron has lower core losses and exhibits high Q for RF applications. Iron Powder cores are available in permeabilities from 1 to 100. The popular materials for SMPS applications are #26 (µi=75), #8/90 (µi=35), #52 (µi= 75) and #18 (µi=55). Iron powder cores have saturation flux density of 10,000 to 15,000 gauss. Iron powder cores are quite stable with temperature. The #26 material has temperature stability of 825 ppm/C (inductance change of approximately 9% with temperature change of up to l25 deg C).The#52 material is 650 PPM/C (7%). The #18 material is 385 PPM/ C (4%), and the #8/90 material is 255 PPM/C (3%). Iron powder cores are ideal in lower frequency applications. Since their hysteresis and eddy current core loss are higher, the operating temperature should be limited to below 125 deg C.
For Material #8/90, max DC bias < 80 oersteds. Good for low frequency application (<10OKhz). In-line noise filters. Able to withstand large AC line current without saturation. Under DC magnetizing conditions, all powder materials exhibit a reduction in permeability as shown in the charts. The data above assumes an AC flux density of 20 gauss. For application such as output chokes, where the inductors are DC biased, the magnetization force (H=0.4*PHI*N*l/l) needs to be calculated, and the number of turns increased to account for the reduction in permeability. If the magnetization force (H) calculated is within the above maximum DC biased limits, the designer only needs to increase the turns by a maximum of 20%. The relative costs of each material is based on prevailing products pricing and raw material costs. These numbers should be used as a guide only. In general Micrometal's Iron Powder #26 is most cost effective, and MPPs are the costliest materials. There are many manufacturers and importers of iron powders cores, and most of them do not exhibit the quality level as those offered by Micrometals.